Bishop Gorman center Zach Collins scored nine points in 12 minutes Wednesday to help the West to a 114-107 win over the East in the boys McDonald”s All American game at the United Center in Chicago. 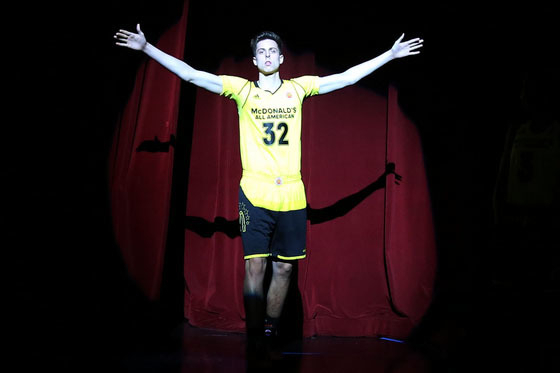 Bishop Gorman’s Zach Collins scored nine points in 12 minutes Wednesday to help the West to a 114-107 win over the East in the boys McDonald’s All American game at the United Center in Chicago. Collins, who has signed with Gonzaga, was 3-for-5 from the field, including 1-for-2 on 3-pointers. He added six rebounds, three assists and two steals for the West, which took its biggest lead at 94-73 on a dunk by Josh Jackson with eight minutes to play. Collins was 3-for-3 from the field and scored seven points in five minutes to help the West take a 52-47 halftime lead. Josh Jackson and Frank Jackson each had 19 points to lead the West. Frank Jackson, who has committed to play at Duke, was 5-for-7 on 3-pointers. Josh Jackson, who hasn’t committed, made 9 of 11 field goals. They were named co-Most Valuable Players. Lonzo Ball, a UCLA commit, had 13 assists for the West. Jayson Tatum, who has committed to Duke, led the East with 18 points. Bam Adebayo added 16 points and 12 rebounds for the East. In the girls game, Sabrina Ionescu scored eight of her 25 points in overtime as the West rallied for a 97-88 win over the East. Ionescu, the only uncommitted player in the girls game, also had 10 rebounds. The West tied the game at 86 on a 3-pointer by Lauren Cox with 57.9 seconds left in regulation. Amber Ramirez, who has committed to Texas Christian, hit five 3-pointers and scored 21 points to lead the East.